“Just Jenny!” | "An Eclectic Array of Topics"
I owe them a debt I could never repay. At the same time, I recognized how difficult this was for her…she was only four month old when we were separarted. She was my ‘link’ to what was good in my life. Of course, now I am remarried to the most amazing guy on the planet. He adores Jenny. For awhile she was terrified of men. 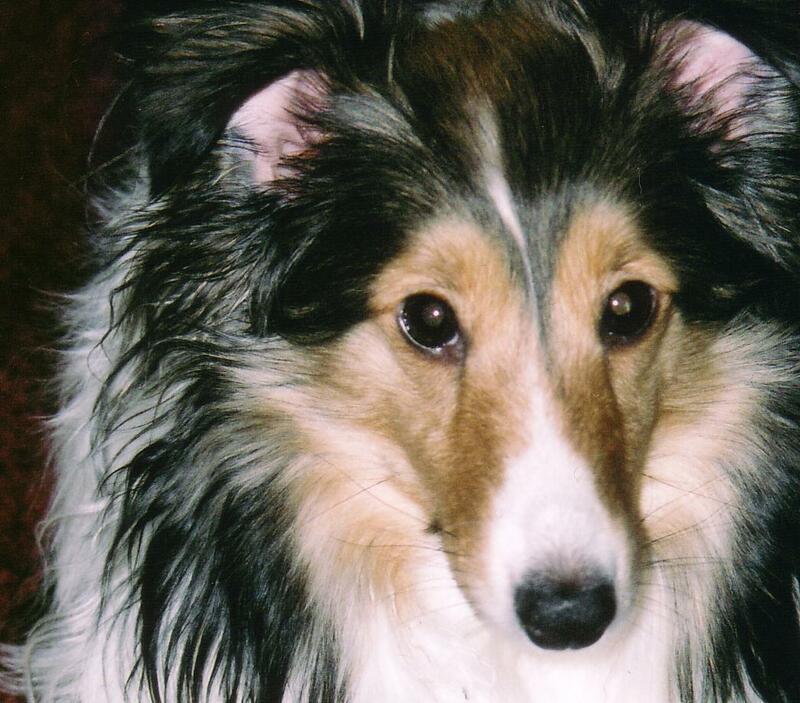 However, after meeting the man that would become my husband…he won her over by giving her…her all time favorite food! He gave her pieces of the orange he was eating. She was as ‘in love’ as I was! 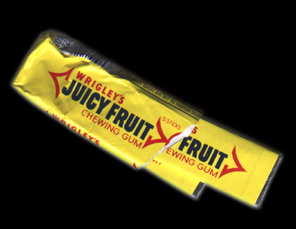 Shortly after we were married, my hubby soon discovered Jenny liked to chew gum! It wasn’t long before we learned that allowing her to chew gum was not good! So we put a stop to that. However, she likes a variety of things that seem a bit odd compared to most dogs. Such as: pickles, lettuce (only with NO dressing!) broccoli, radishes, celery, grapefruit slices, bananas, and sourdough bread. OMG! If my hubby has a piece of this bread…she is absoluetly beside herself until her gives her a tiny piece. She is used to wearing an array of hats, bandanas, tee-shirts and yes, even sunglasses. Her sunglass have rhinestones on the sides…they were given to her by a friend whose daughter had outgrown them. She is a “Therapy Dog”…she is known as “Nurse Jenny”…soon to be…”Doctor Jenny” once her advanced training is completed. At first, she was allowed to sleep at the FOOT of the bed…on a special blanket. (My hubby called it her “United Nations” blanket…due to its color). However, she soon learned that when her “Daddy” was snoring…she could sneak up and wedge herself between his pillows. To this day, I have no clue why she does this…since she cannot get out by herself. I have to pull her out by her front paws. We both love sports. 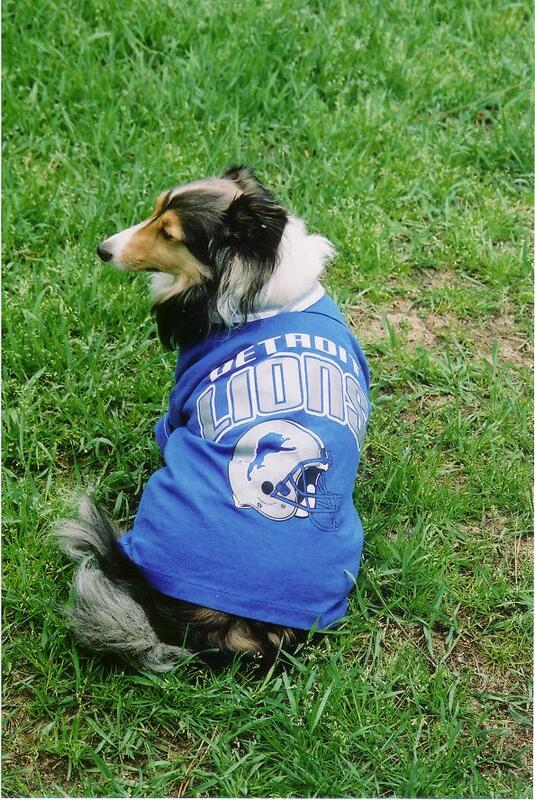 Since we are originally from Detroit, we are dye-hard Lions fans and “RedWing” fanatics. Jenny has tee-shits that display our loyalty to our teams. 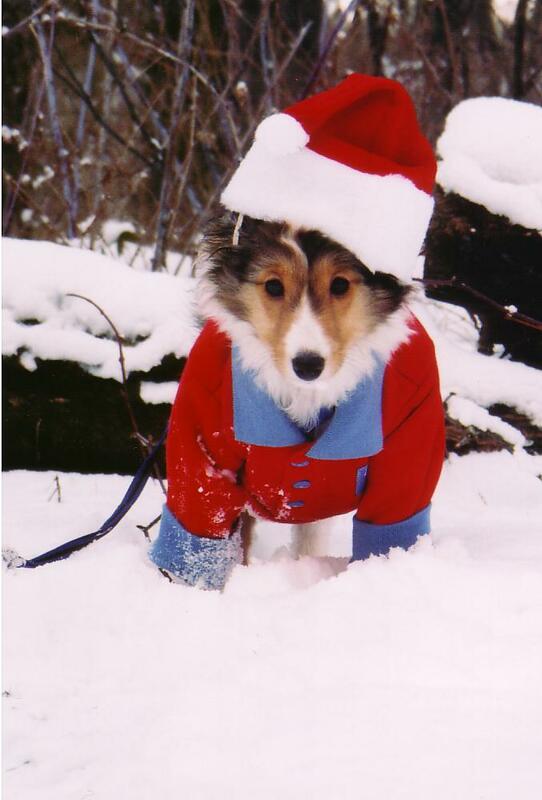 Jenny absolutely loves the snow. From the time she was a puppy she’s been fascinated by snow. Currenly, we have quite a bit of snow on the ground. When I let her in the house…she runs in very fast. She also knows how to push snow, until she makes a snoball…then tries to bring it into the house (which, I’m sure, is her reason for running in the door so fast!) My hubby thinks its funny…I do not. 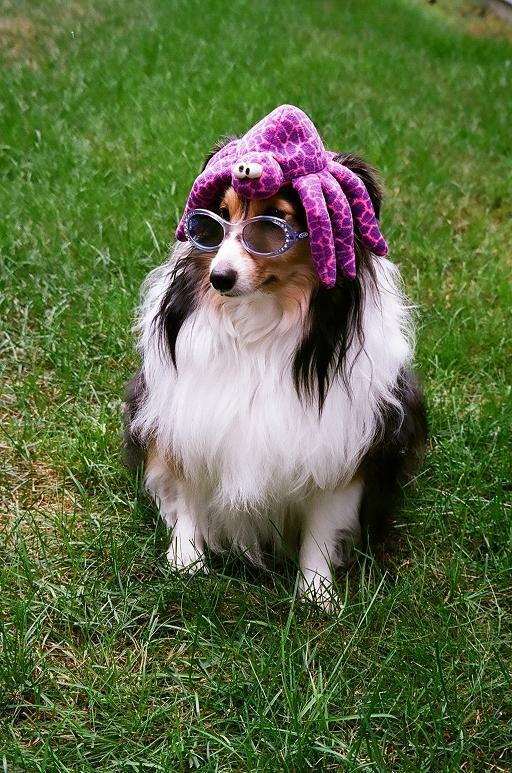 She has also won a “Halloween” costume contest. 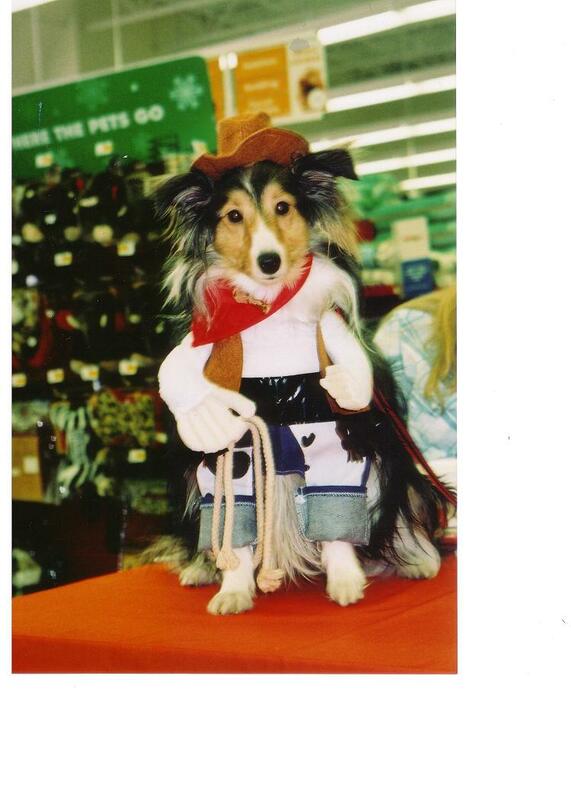 She was a “Cowgirl”! There were other contests as well…but for some reason, she loved that cowgirl hat. Jenny has huge bags of toys. She also has a toy box full of toys. I only have a few out at a time and rotate them. She always thinks she has something new. This past week-end…I had some repairs to do on many of her “babies”. My hubby called it “Animal Hospital”. I had my sewing kit out. There were almost a dozen “babies” that needed ‘surgery’. Some as major as sewing on an arm or leg…however, two required a complete “amputation” of a limb. Yet, I am glad to report that they all survived. 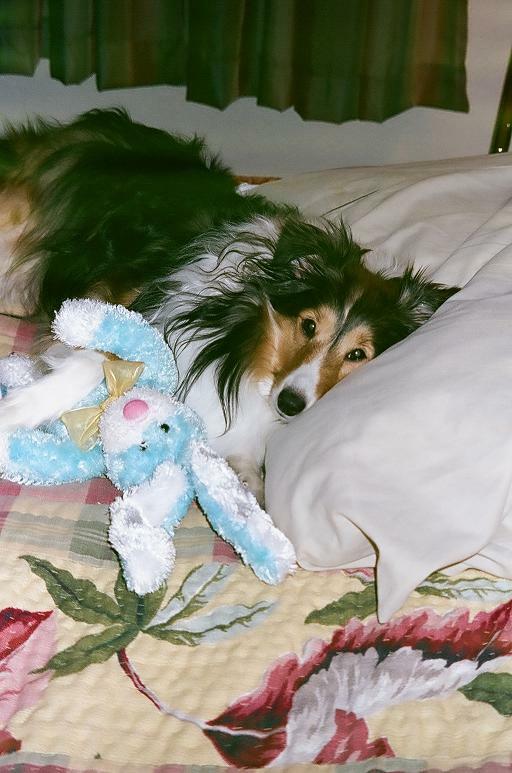 Her “Blue Bunny” baby was totally made whole! For her first Christmas, my sister got me a book. 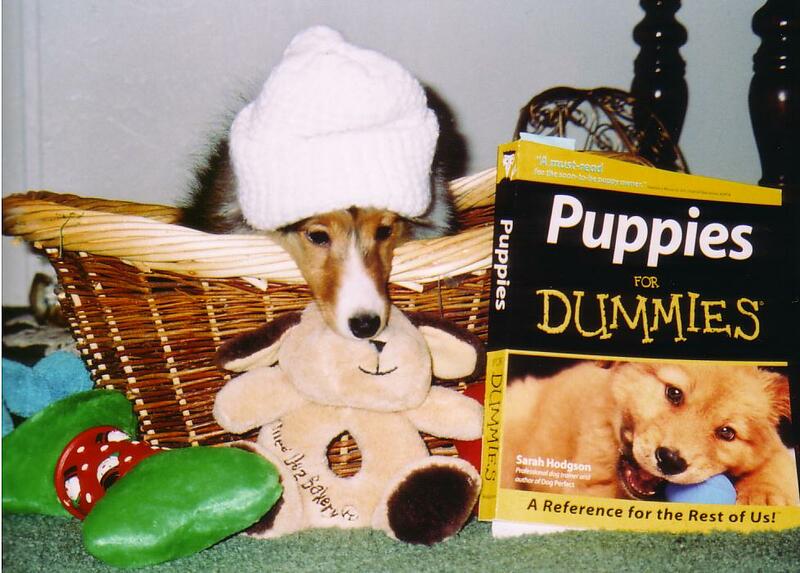 I was by no means a novice dog owner…but the book proved good for this photo! I would love to hear from those of you that have pets of your own. Share with me your own stories. Due to the fact I had a bit of extra time tonight, I decided to do this post. “Just Jenny“…but now I need to stop. I will put in one last photo. 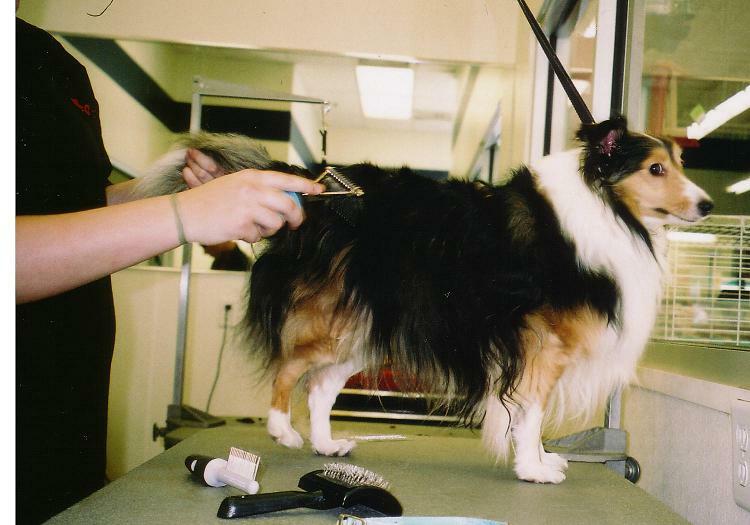 It’s of her while she is being groomed…which is not exactly her favortie thing! Oh well…I must include one more photo. I call it her “Naughty Face”. She pouts if she gets scolded. 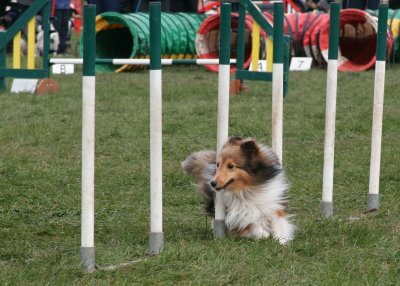 Jenny is on the small side of the AKC Breed Standard for the Shetland Sheepdog. She is only 13′ high at the shoulder. Oh, Michelle, she is so adorable. I was also in an abuseable relationship. My ex killed my puppy, Tottles. 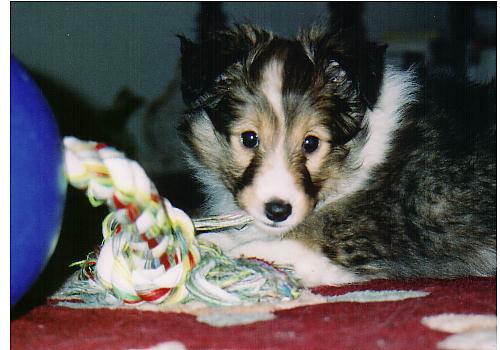 She was the first dog I had ever had. I love to here good stories like this one. Good job!!! Jenny is so happy now (as I am). Her “Daddy” is a health care professional…so they “work” at the same hospital 🙂 She loves to visit her patients and always walks in carrying one of her “babies” in her mouth! You did it again. Simply wonderful post. Very uplifting. Like so many of your readers, I find your knowledge base amazing. There is always something fresh and new on your blog. Also, like others, I enjoy your articles in the Times and the Post. Jenny is gorgeous. It sounds as if you struck gold with finding a good man. After such a hard time for so long, I’m glad you are happy. Thank you for taking the time to read this post. You’re right…I did stirke gold when I met my hubby! It was not only “gold” for me…but Jenny as well. Thank you Robb! 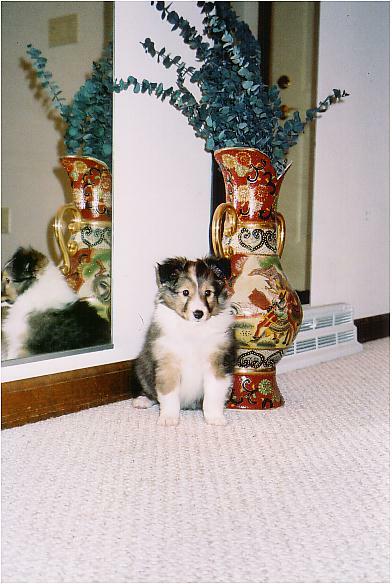 The photo you emailed me of your new puppy is wonderful! You should post it to your site. Her naughty face made me laugh. She’s a cutie. First of all, your pictures and story of Jenny were so darn charming. She was a beautiful baby, and she seems like a good sport in all those outfits. I had to show her to my husband. Neither of us have ever had a dog (We live in a condo, and can’t have dogs) but we love animals and we laughed and laughed at your pictures of her. I love that you call her Nurse Jenny. I call my cat Nurse Bea, as she is very helpful to me throughout my many illnesses. I am sorry to hear you had to live in a shelter and cant imagine all you must have went through, but I was happy to hear that you didn’t lose your dog when you lost your home. How WONDERFUL is it that the Humane Society does this for DV victims. I’m deeply appreciative of your wonderful comment. I agree with you…it’s an a tremendous blessing that the Humane Society works in conjunction with the Women’s Resource Center. I don’t know if they ALL do…but the one here, locally, does. This is an enormous stress off those needing shelter from DV. Hi loved reading your post. Her poutie face, she’s beautiful, my dog actually argues with me if he thinks he’s right and I’m wrong on a subject. We can have 10 minute arguments, funny thing is when he does that he’s usually right, and feels he may have been called naughty when he wasn’t. I am so glad you have a new life with someone deserving of you who treats you right. I am so sorry for Dee losing her puppy, and glad you didn’t lose yours. I have just put two photos on my blog of electronic weapons, lasers/tasers? being used on my dog. I can’t understand people who can hurt animals, but know they do. The eyes say it all in that grooming photo! !LOL Fortunately, none of my 4 need professional grooming – they are short haired, flat coated – but still manage to shed!!! Only one willingly gets in the tub – but the expression on his face while enduring the bath, must be photographed one of these days!!! She is absolutely adorable- mini Lassies are the best!! !